Clean off your pinecones and make sure there isn't any dirt or critters lingering (I found a tiny tiny bug inside my pinecone that I would not want hanging out in my house!). You can use a damp paper towel to clean the dirt right off! 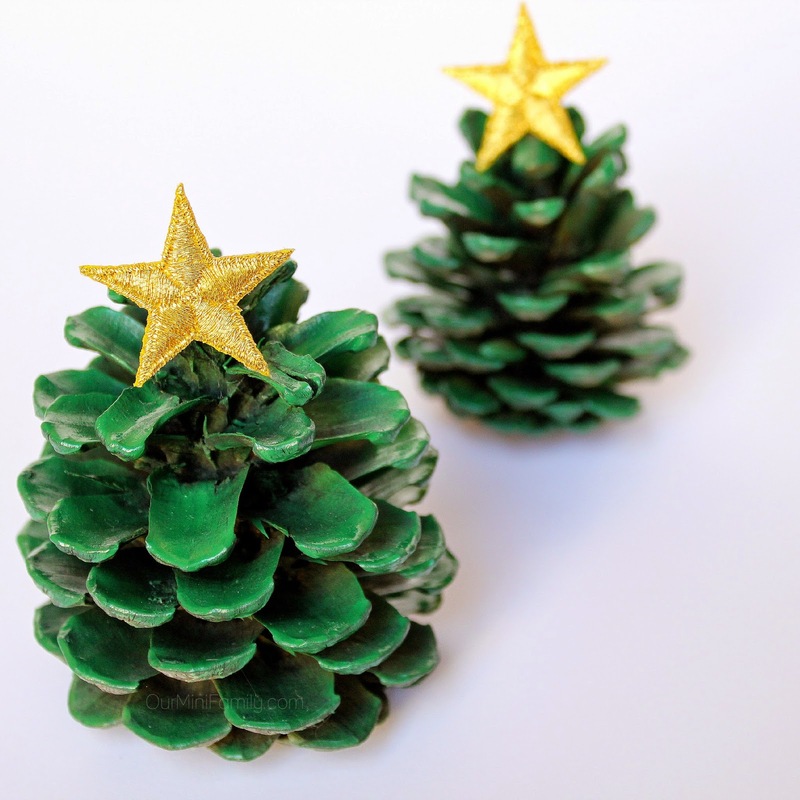 Once they are dry, grab your favorite festive green paint and cover the pinecone! Let it dry completely after you are done--this is very important that the paint is not tacky any more. When the paint is completely dry to touch, grab your glue and prepare to attach your gold stars. I bought my gold stars online from Amazon on this website. Once you glue your stars, allow ample time for them to set with the glue and dry--and then show them off! Awe, what a simple yet gorgeous idea! i never would have thought of this, thanks!! Oh my goodness, these are the cutest things I've seen! What an adorable and clever idea. I love! Awww thanks hun! You are so sweet! Oh what a fun craft! I think my kids would love to make it. I think it would be a really neat crafts for kids for sure! Those are just great. We used to make things like that just by painting the ends, but these are so much prettier. Thanks for sharing. Aww I am sure yours looked great, too! But thank you!! These are so cute! 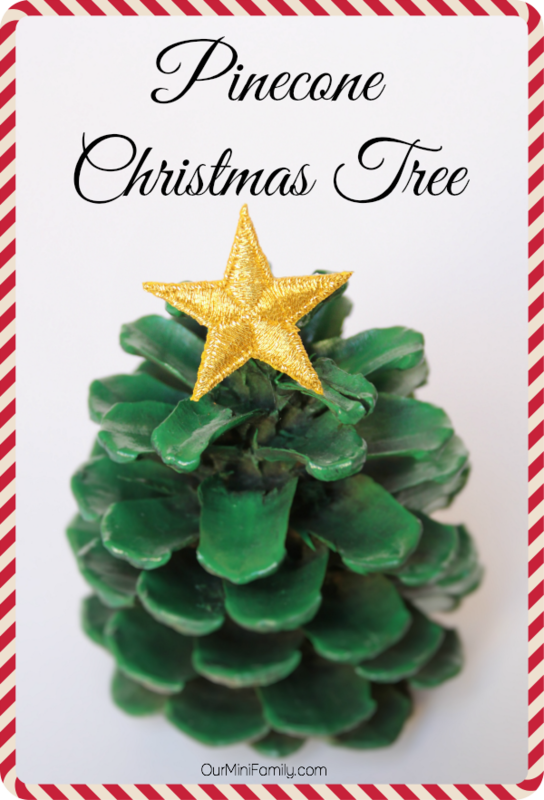 I have been looking for more holiday activities for my toddler and I to do! Awesome! I hope you consider doing this! These are very cute! My kids went out a last week and gather a whole bunch of pine cones, and this would be more interesting than just sitting them out in baskets like I was planning! That is a good idea, too! I had been putting them in baskets in the past as well. If you do end up trying our DIY, would you mind letting us know? We'd love to see how it comes out for you!! These are so cute! It would be a perfect craft to do with the kids! I'm so paranoid, so I always spray them with bug spray and let them sit for a week before I bring them inside. I'm a freak like that. I love the end result though! These are too cute! My kids would love to make these! these are so cute. I love all your crafts. These are so cute! I have made big Christmas trees with the bigger pine cones. Thanks Lisa!! And I bet they look awesome with bigger pine cones!! It would be cute to do assorted sizes of them and have them on a mantle or something! What a cute idea. I have some pine cones I picked up on a trip and I want to do a craft with them. This is a great thing to do. Glad I found your post. Thanks hun! And yes this would be PERFECT to craft with since you just got some! These are so cute and simple. Thanks for sharing. Oh my goodness, adorable! Thank you for sharing! Awww of course! My pleasure! I like it.Nice for my Chrismas tree. I so wanna do this next Christmas! These are adorable, thank you for sharing them with us. I remember doing something similar to this when I was a kid. I will put it on my craft list for my grandchildren next Christmas. Thanks. Yeah that is a great idea--love that you have a list! You're welcome! I am glad you like it!! Oh my gosh these are so cute!